In my last post, I blogged on the recent sale of my beater Jeep this past weekend, and I thought this post would be a good follow up, even though I purchased my newer car before I sold my old one. 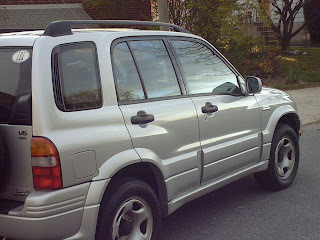 I am now the proud, debt-free owner of a 2000 Suzuki Grand Vitara. On New Year's Eve 2009, I got the "itch" to replace my car. I'm not sure exactly why, other than I had some time on my hands to search for a vehicle, and I had about $3,500 cash saved to buy my next car. I believe I was ready to find my next car because I have needed to get something a little newer and more reliable than my 1995 Jeep. Search for sales. I went on Craigslist and searched for specific vehicles. I was mosly interested in a small, 4-wheel drive vehicle, capable of handling a very snowy winter. Research. Once I found a couple of vehicles I was interested in purchasing, I did some web research on price, dependability, and customer satisfaction. Phone call. I picked the best choice on my short list, and called a small auto dealer in downtown Kansas City. I spoke with the owner and arranged to test drive the car within the hour. Test drive. I test drove the vehicle, kicked the tires, and checked out the engine. Everything seemed to be in order, so I negotiated a slightly lower price and the owner accepted. Details. I then signed all the paperwork (title and bill of sale), paid all cash, and drove away. I feel blessed that I was able to purchase a car for the first time free and clear. I know a lot people (especially men) place much of their identity into their cars and go deeply in debt to keep up an image. For me, a car is just a car. Yes, I would like it to be in good shape and have certain features, but a car to me is mostly a means to get from point A to point B. I just need to get their safely and reliably. I don't need to prove my manhood or portray a financial status. Being debt free is more important to me than all of these other things. Have you ever purchased a used vehicle on Craigslist, and what was your experience? Were you able to get a good car at a good price? Did you pay cash and negotiate the final price? I never bought a car/jeep on Craigslist but I did sell one. It was a 2002 Civic. I used craigslist posting service and I got a lot of bids for it and finally sold it at a good price.